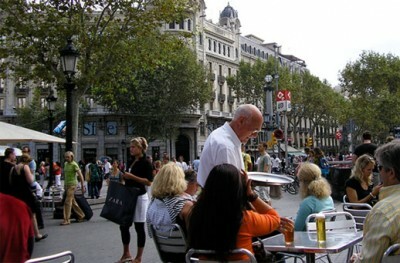 La Rambla, which translates to ‘intermittent water flow’, is the iconic hub of Barcelona, a predominantly pedestrian-only plaza stretching nearly a mile through the historic center of the Spanish city. The central area is filled with outdoor dining areas, merchant kiosks and countless strollers, bordered on either side by traffic-calmed two-lane roads for cars, which are then fronted with restaurants, stores and residences. Servers (pictured) cross the traffic lanes to cater to customers in the plaza. What makes it one of the world’s greatest pedestrian streets? Not only is it one of the longest pedestrian streets anywhere (three quarters of a mile), but it maintains an intense vibrancy all the way through. Most cities have difficulty even considering the idea for a single block. In fact, even when La Rambla ends, the streets beyond it are packed with outdoor diners – its energy extends beyond, as most inspiring places do.